Running my second ever 5k! – The Small Things. Running my second ever 5k! 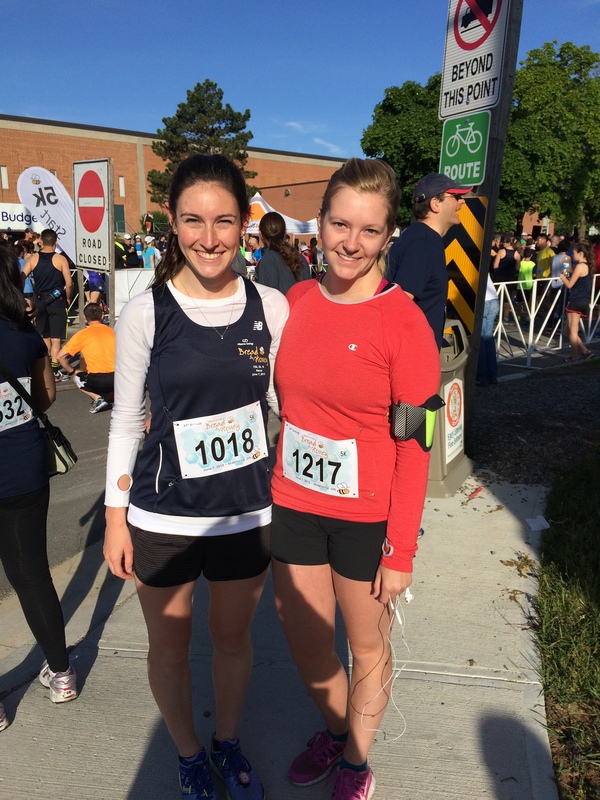 One month ago I ran my first ever 5km race! Actually the term “fun run” is probably a much more accurate description. The goal was to run a 5k and I am happy to say that the goal was successfully achieved! Woot Woot!! Afterwards I was fine to call it a new experience for the books and leave it at that. Well, one of my very best friends, Karin (pictured above), was not going to have that. 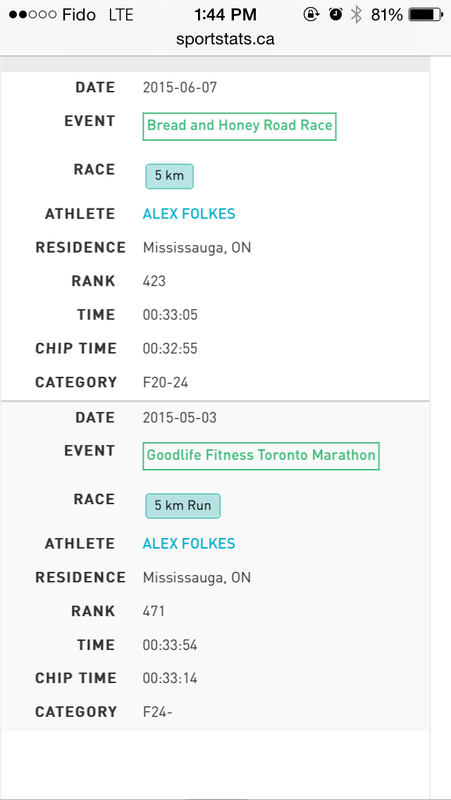 “Sign up for another race as soon as possible!” She said, “You worked so hard to reach that goal, why stop now?”. 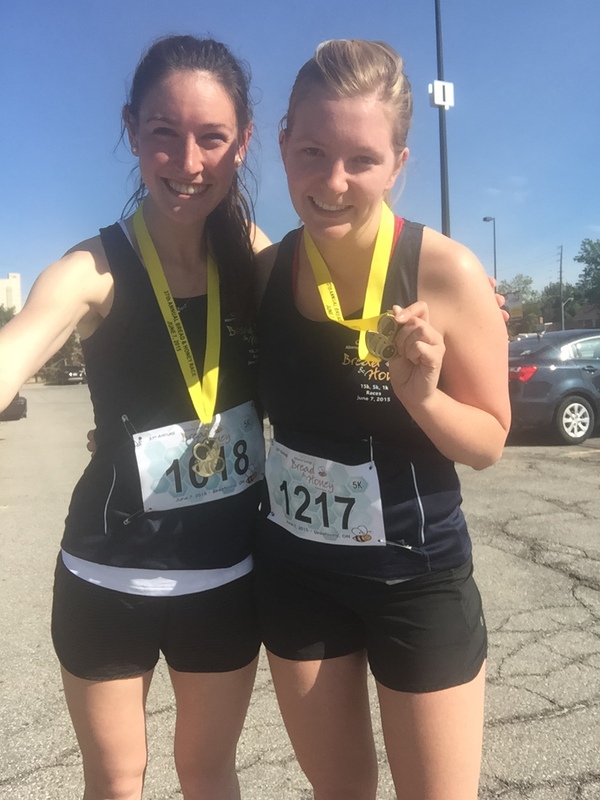 So I followed Karin’s wise advice and together we signed up for the Streetsville, Bread & Honey Festival 5k, which we ran this past Sunday. Karin is a real runner. I know, I know, as long as I am running, I too am a real runner… But I’m not. I wouldn’t define myself as a runner. Rather I am someone who has recently learned to somewhat enjoy running. Where as Karin has been running track, cross country, ect. for as long as I have known her. For the record, we have been besties since our joint sweet 16 birthday party in 2007. Look how precious and young we were! Anyway, my point is that Karin (being a real runner) is super speedy! So from the start we knew that we wouldn’t be running buddies for the actual running part of the day. But we were running together in spirit! Karin did amazingly well, coming first in our age category (20-24)! 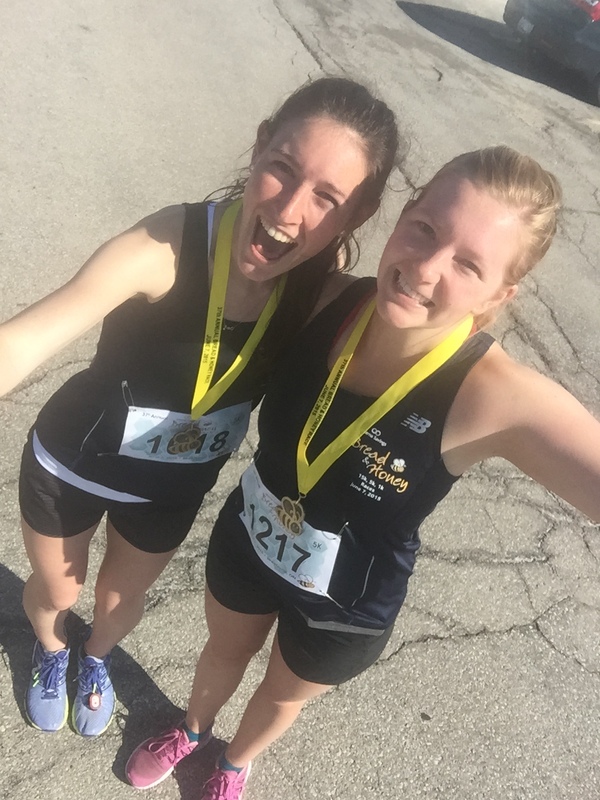 She managed to run the entire 5k in 22 minutes and 35 seconds! I was so impressed and proud of her! I decided to run in long sleeves because the air was chilly, despite being so sunny.I also use headphones as long as they are permitted. I actually find running incredibly monotonous so the music helps keep me interested. When the race began Karin speed quickly to the front of the crowd and I settled into a spot in the front of the middle. I thought I was maintaining a good pace but when the road started sloping downward slightly I realized just how fast I was going. In one sense it was awesome that my muscles can maintain a faster pace, but unfortunately my lungs cannot. One of my biggest running struggles has been consistently maintaining an even breath. If I am not 100 percent focused on my air flow it will very quickly go all over the place. This was unfortunately the case on Sunday. I got the worst THE WORST runners cramp in my right side just as I reached the 2km mark. At first I tried to slow down my pace but still jog, this didn’t work out. The movement from each food hitting the pavement caused so much pain where my cramp was. So I slowed to a quick walk, I really focused on slowing my breath and I massaged my side with my hand. I basically had to walk for an entire km before the cramp subsided. I was super disappointed about having to walk but there was honestly no way I could have pushed through it. I cried. Seriously. While I was walking I had tears pouring from my eyes. Half from pain and half from disappointment in myself. As soon as I was up and running again I found a comfortable pace and stuck with it almost all the way to the end. When I came upon the finish line a shot of adrenaline rushed through me! I don’t know if it was the music, the crowd, or knowing that it was finally going to be over but I pushed myself so hard! As I crossed the finish line I looked at the clock and happily realized that, despite having had to walk, I came in exactly 50 seconds FASTER than my first 5k! 50 seconds faster! Imagine how much better my time would have been had I not gotten that cramp! If I wasn’t addicted to participating in races and events before, I sure am now! Sometimes when your training alone it is hard to tell if you’ve actually improved at all. But obviously I am becoming a stronger, faster runner! Slowly but surely! Unfortunately there are no July events that I can participate in, so Karin and I are looking at some dates in August. For the time being I want to continue to focus on my 5k time. Getting faster and managing my breath. Perhaps next summer I will look at some longer distances. Run on my friends! Great job to you both! You ARE a real runner! I am far from speedy, but consider myself a real runner regardless of pace! Thanks, Michelle! I started my running journey in January, I think if I am able to stick with it for a year and keep pushing myself to improve then I will call myself a real runner. Aren’t they the most adorable medals ever! I would have taken pictures of the kiddies but I felt creepy. Thanks for all the support and encouragement! I love the bread and honey race. The 15k route is a nice run! Congrats on beating your old time. It is crazy how fast we become addicted to these runs!! Depending on how my training goes maybe I will tackle the 15k next year 😮 Thanks so much! Great work, I need to get into training! Thanks so much! I used the app couch to 5k to train. I loved it and found it super successful as a starting point.